May « 2016 « They Said What? If there is one thing that has directly impacted the health and productivity of many workers over the last ten years that was to a large degree predictable, avoidable, and remediable, it would have been opioid use. So naturally, the workplace wellness industry (along with most wellness-obsessed insurance carriers and the equally wellness-obsessed CDC, the subject of a future posting) missed it altogether. Health risk assessments (HRAs) asked lots of questions and gave lots of advice about drinking and illegal drug use. But opioids were generally obtained legally, with prescriptions, and reimbursed through PBMs…and rarely if ever found their way into HRAs. The wellness industry ignored opioids in every way possible. They thought it was much more profitable and less controversial to tell employees to eat less saturated fat and, of course, salt. And of course get annual physicals and prostate checks. We talk about the those direct harms of “pry, poke and prod” workplace wellness all the time. However, the indirect harm was equivalent: we were taking our eye completely off the opioid ball. *In defense of the wellness industry, since most employees lie when they answer those HRA questions and/or ignore the advice, it is possible wellness vendors would have had as trivial an impact on opioid use as on everything else they address. However, they could have at least tried. Well, if you insist. Here is the link to the interview Fred Goldstein just did with me on Gregg Masters’ show. And if you ever get a chance to go on the show or advertise on it, take it. Check out the little icon that we web administrators see in the upper LH corner of our screens. We usually get a lot of visitors (way over 100,000 in our existence, and 5130 followers) but the hour when the podcast was live is our best-ever hour, and makes our typical hours look pretty trivial by comparison. We often point out that the average eighth-grader knows more about math than wellness vendors do. But that’s OK. No one expects wellness vendors to know math better than an eighth-grader. However, we do expect them to know wellness better than an eighth-grader. But it turns out at least one eighth-grader also knows more about wellness than wellness vendors do. Within the last few months, we and others have explained to wellness vendors why their obsession with BMI is misguided in many ways. It turns out that BMI misses both people who are healthy but fat, and people who are unhealthy but thin. No surprise, given that BMI was invented by a 19th century mathematician more concerned with measuring whether populations as a whole were not getting enough food than whether individuals were getting too much. A 14-year-old girl who carries 175 pounds or more on a 5-foot-7 frame, such as Tessa’s, falls into the obese range, regardless of how muscular her frame may be. Earlier this year, Tessa writes, she started having doubts about her body — not unheard of for a teenager. She recounts wrapping Ace bandages around her stomach to make her look slimmer. So we ask vendors, why? Why do you insist on using a metric that is less than worthless? The employed population (not to mention the employers who pay for this stuff) gets no benefit from this. 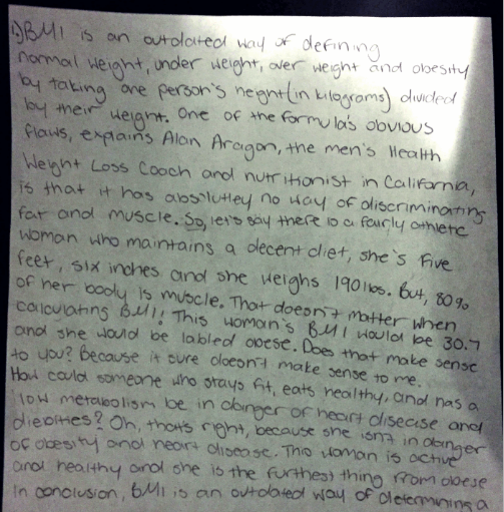 And as this article describes, BMI obsession creates a body-image issue as well. and Aetna spent $500/employee but didn’t reduce it. I realize that, as wellness vendors, you need to find some way to snooker employers and show employees who’s boss, but can’t you come up with something that doesn’t actually harm people and might possibly have a chance of working? Ironically, the wellness industry doesn’t understand irony. May 25, 2016 9:20 am / 2 Comments on Ironically, the wellness industry doesn’t understand irony. The wellness industry is about nothing if not irony. Ironically, wellness vendors and consultants don’t understand irony, so they keep doing and saying things they think are being taken seriously. Ironically, they are being taken seriously, but only by students of irony. For example, these wellness people don’t understand that it is ironic that employees can be forced to submit to “voluntary” wellness programs, or face fines of thousands of dollars. They say this unabashedly. Whereas when we make an ironic comment, such as: “Wellness vendors make employees happy whether they like it or not,” we do it deliberately. The May issue of Managed Care displays a cornucopia of unintended irony, in a debate between myself and Harris Allen, of Navistar fame, on the effectiveness of wellness programs in preventing diabetes. Speaking of Navistar, Mr. Allen was already famous for irony before this debate. He showed Navistar how to claim a wellness ROI of 400-to-1, later reduced to 40-to-1, before jumping again to 400-to-1. That by itself — adding/removing extra zeros in your ROI but claiming it’s real the whole time — is ironic, but that’s not even the ironic part. The irony is that he was concocting these figures even as Navistar itself was making up $4-billion of phony shareholder equity, perhaps including these wellness savings. A lot of the perps (excluding Harris) are ending up in jail over this caper. Ironically, despite his pride in his work on wellness for Navistar, he didn’t cite their results in his counterpoint. Not being Navistar shareholders ourselves, we found this whole escapade highly amusing, so it is recounted in This Is Your Brain on Wellness, our humor column. He cites that exact same company and exact same validation to conclude: “See, wellness vendors can succeed.” Yeah, one wellness company has succeeded while the staggering number of failures — companies that couldn’t get validation or didn’t even bother to apply — is in the thousands, a statistic I noted just yesterday. The final irony is that Mr. Harris ends his argument with a call for “evidence-based” wellness programs. 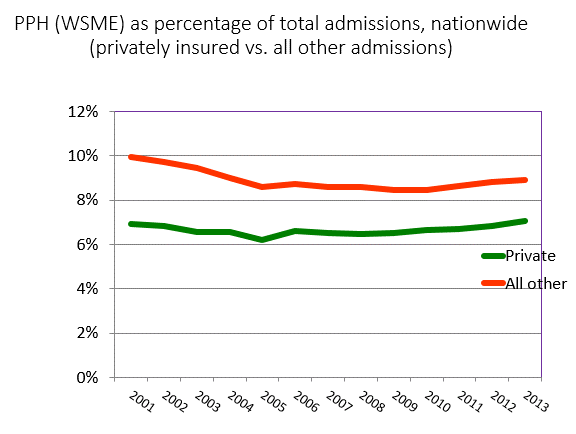 Ironically, the “evidence” is overwhelming…in the other direction: wellness programs have not avoided a single wellness-sensitive medical admission, according to US government figures. The green line below represents the wellness-exposed population while the red line represents the rest of the country. There is no separation, meaning that the wellness-exposed population has achieved zilch. Actually, there is slight separation –but ironically it goes the other way. You’d statistically be better off not being exposed to wellness. This graph is part of my proof of the ineffectiveness of wellness vendors, and allows me to offer a million-dollar reward to anyone who can show wellness doesn’t lose money. Where did the government get the data for this graph? It was compiled by Truven Health, the division of IBM that — you guessed it, ironically — employs Mr. Goetzel. In total, those books cost less than $100. “Businesses in the public sector”? I realize many of our legislators are for sale but I didn’t know they had incorporated. A full review of the IBISWorld tome, “New Report Raises the Bar for Cluelessness in Wellness,” can be found here. And now may I introduce The Global Market for Population Health Management, 2016. Before you mortgage your firstborn to fork over $5400 for this one, I would suggest reading the “highlight” that they were kind enough to put right on their website. The “global economic burden of chronic disease” rising to $240-trillion would be quite a feat, given that total global economic output itself is only about $70-trillion. However, macroeconomics might be the opposite in wellness too. At the same time, suppliers are deterred from entry or expansion due to success-based compensation models, global recession-based pricing pressures and the consequent perception of low margins. Vendors are “deterred from entry”??? So the world is suffering from a shortage of wellness vendors? That might be news to the thousands of HR departments who get pestered by these vendors on a constant basis. Try googling on “empower” and “wellness.” You’ll find seven companies with some variation of those words in their name. A good rule of thumb is that an industry in which seven companies have the same name is not suffering from a vendor shortage. Mr. McGrigor attributes this shortage to two factors. First, “success-based compensation models” are holding the industry back. In other words, the reason wellness vendors are failing is that they can’t succeed. As an aside, Quizzify has a success-based model. We are often asked why we offer such a model when wellness vendors don’t, as though guaranteeing success is a bad thing. So Mr. McGrigor has it the opposite of the way it is: buyers assume wellness vendors will fail, and look askance at those that guarantee success. Second, vendors are “deterred from entry” because of the “perception of low margins.” For $5400, an author should be required to understand basic economics. It’s just the opposite of what Mr. McGrigor says. As I used to explain to the students when I taught economics at Harvard (you knew I would work that in), the price of milk isn’t low when the price of cows is low. The price of cows is low when the price of milk is low. So if wellness margins are low, it’s not because vendors don’t want to enter the market. It’s because the world is drowning in a sea of “empowered” wellness vendors. One place margins are not low, though, is in books telling everyone how great the wellness industry is. However, there is another rule of thumb in economics too: you could have the highest margins in the world but you still won’t make any money if you have no understanding of the subject matter you are writing about. Unless he is banking that wellness economics are the opposite of everything else, which history suggests isn’t such a bad bet. Jon Robison just posted the best-ever summary of arguments against “doing wellness to employees” that I’ve seen. He summarized and invalidated all the nonsense in about 600 words (admittedly including a bunch of links, to this site and others). However, the posting was unbalanced. He left out the best argument in favor of undertaking a “pry, poke and prod” program, the more comprehensive, the better. If you are located in “Silicon Alley” in Manhattan, compelling your employees to participate in a “voluntary” program will inspire some of them to quit, because it will be perfectly obvious to them that management has no idea how to treat valuable employees. Then Quizzify can hire them…and we don’t care what they weigh. Like George Orwell and Humpty Dumpty, the wellness industry (thanks largely to the Business Roundtable pressuring the EEOC) has now managed to redefine wellness programs as their opposite: “voluntary” now means “required,” in the sense that if you don’t volunteer to submit to “wellness or else” you could be fined up to about $3600 (if you spouse is on your insurance), which is a little less than 10% of the median annual wage, and exceeds the amount in many people’s savings. Jon Robison and I just posted a “Pulse” on the wellness industry’s creative use of the English language, which rivals their creative use of fifth-grade math.